There are three schools of thought. The cynics hold that a good advertisement is an advertisement with a client’s OK on it. Another school accepts Raymond Rubicam’s definition. The best identification of a great advertisement is that its public is not only strongly sold by it, but that both the public and the advertising world remember it for a long time as an admirable piece of work. I have produced my share of advertisements which have been remembered by the advertising world as admirable pieces of work,but I belong to the third school, which holds that a good advertisement is one which sells the product without drawing attention to itself. It should rivet the reader’s attention on the product. Instead of saying. What a clever advertisement, the reader says, I never knew that before. I must try this product. 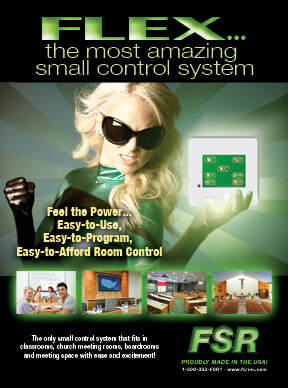 The client needed an impactful image be used in all visual applications for FSR’s Flex-LT, a self-contained room control system. The device is designed primarily for non-technical users in classrooms and meeting rooms. It provides an easy-to-use color touch screen that controls any source being displayed including volume, lights, shades or movie screen. the first to be produced in a compact size. The client supplied the headline "the 3D invasion is here." From this starting point, we determined that the best way to portray the 3-dimensional aspect and tie it into the campaign slogan was to use "alien space craft” coming out of the projector’s lens. This concept suggested the many 3D films that feature science fiction, animation, and horror. The alien images were produced from stock footage allowing the project production costs to be well within budget.